The Sega Mega 3 is an unlicensed Sega Mega Drive clone console distributed in South America. It looks and feels much like a Genesis 3; however, it does not have the same build quality or the official endorsement of Sega. The package claims the console is officially licensed by Sega, as indicated by the presence of Sega's Seal of Quality. Even the box contains stolen artwork, and claims the console has been distributed by Majesco. It also contains the CE mark, meaning it has apparently met the standards of the European Union, despite not being sold in Europe. Some units are made by a company called Level Up, related to gaming and widely known in South America. Some models come with a pirate version of a game, although the box claims cartridges are not included. Additionally, some models, primarily those named FP-16 consoles, also contain several switches that allow the user to set the console's region code. The Sega Mega 3 is a very common console in South America, moreso than real Genesis 3 imports. There are at least two different versions of the console which can be identified by the console unit itself. Some Mega 3s have the words "MEGA PLAYERS 3" printed on the console and controllers, while others have no text whatsoever. It is unknown which came first. It is assumed that like a real Genesis 3, there are compatibility issues with various add-ons. 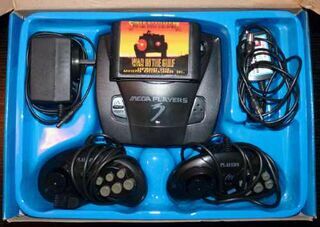 Non-printed version of the Mega 3.